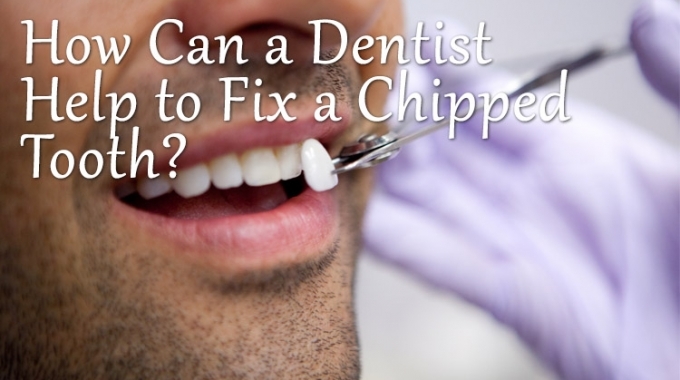 Have you chipped a tooth and now wonder what to do? A chipped tooth is a very minor tooth fracture that doesn’t displace the tooth, cause the gums to bleed, or cause damage to the pulp of the tooth. Yet, a chipped tooth can be irritating and can mar an otherwise beautiful smile. What can yourl dentist do about it? Here are some of the options for treating a chipped tooth from your Paris dentist. Usually, the only problem you will need to treat immediately is a bit of roughness or sharpness that irritates your tongue or the inside of your cheek. You can do this easily by covering up the edge of the tooth with orthodontic wax or sugarless gum until you see the dentist. ‘If the tooth itself is in pain, you might have a more serious fracture that needs prompt attention from your dentist. Call our office to make an appointment as soon as possible. Your dentist can place a filling on the broken edge of the tooth to restore it to its natural shape and smoothness. Direct fillings, such as composite resin, can be made by the dentist at chair-side and placed on the same visit. For indirect fillings such as gold or porcelain, your dentist needs to make impressions of your mouth and send them to the dental lab so the fillings can be produced. Talk to the dentist about appropriate filling options such as composite resin, gold or porcelain. A dental crown can restore your tooth to its natural appearance. Your dentist begins the process of placing a crown by shaping the tooth and taking impressions of your mouth. The dentist may then put on a temporary metal crown you can wear while you wait for the lab to fabricate your custom-fit crown. At your second visit, the dentist removes the temporary crown, fits the new crown to the tooth and cements it in place. If you have more than one tooth that is chipped, discolored or misshapen, you might take this opportunity to have dental veneers placed on your teeth. This cosmetic dentistry solution allows you to have a more attractive smile that also looks natural. The veneers are made of thin, wafer-like shells which the dentist places directly on the fronts of your teeth. First, the dentist prepares your teeth and makes impressions. After placing temporary veneers on your teeth, we send the impressions off to the dental lab so your veneers can be made. On your next visit, your dentist fits the veneers to your teeth. You can approve them or request changes. If you approve them, your dentist places them on the fronts of your teeth, cements them into place, and then makes any minor adjustments needed. Chipping a tooth is minor incident, but it can have major implications in the way you see yourself and others see you. If it happens to you, tell your Paris dentist what you hope to accomplish with general or cosmetic dentistry treatments. Your dentist will tell you what you need to know to decide on the right solution for you.